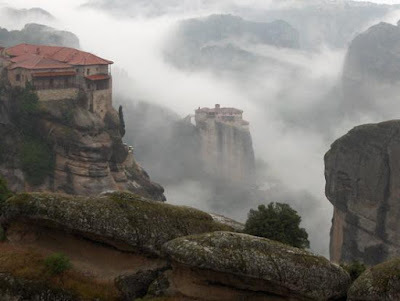 In Greece today there are 1000 working monasteries, that is, monasteries where there are monks and nuns, and another 150-200 waiting to be restored. The Athenian who told me this had himself compiled a book giving a one-paragraph description of every monastery in Greece, detailing the name, address, number of monastics, listing miraculous icons and relics, and giving road directions. His "address list" came to over four hundred pages. Greek monastic life is definitely alive, and the young people who are coming to the monasteries are eager to throw off the secular modernism that is creeping into all traditionally Orthodox countries. They come with the enthusiasm of the first monks who fled decaying Rome for the deserts. As a note of interest, Russia in 1917, with almost 90 million people, had 1025 working monasteries. Greece today, with a population of 10 million, has 1000, and that after almost 500 years under the Turks, World War II's devastating occupation by the Italians and Germans, and a bloody civil war that almost destroyed the country. To be just, Russian monasteries often had hundreds of monks or nuns, as opposed to the much smaller numbers in Greece, and the Russian figure does not include the many unofficial sketes that existed before the Russian Revolution. Nevertheless, contemporary Greece, a country one-third the size of California, and in the midst of a headlong rush to catch up with the lamentable worldly sophistication of Europe, continues to support a thousand active monasteries with many young novices. That is a statistic to give any Orthodox Christian hope! From Evlogeite! A Pilgrim's Guide To Greece, pp. 15-16.